We are committed to providing outstanding support and service to our graduate students. 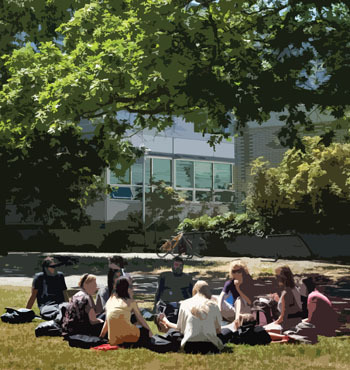 We take great pride in each of the students who choose UBC Forestry as their home for this critical phase of their education. Our aim is to ensure that Forestry graduate students feel valued and respected, are engaged in the intellectual and social life of the department and faculty, and are well prepared for the future when they complete their graduate program. In both the Fall and Winter terms, the Forestry Graduate Program office staff meets with new students for lunch and orientation. A faculty-wide Welcome BBQ is also held early in the Fall Term, as well as a wine and cheese social evening specifically for graduate students and faculty members. A variety of graduate-oriented workshops and seminars occur throughout the year, in addition to social evenings and sporting events organized by the Forestry Graduate Student Association (FGSA). Students are supported administratively by staff that are unfailingly focused on their timely and successful completion.